From our home and office views today it looks like a gorgeous end to the week -- 50s this afternoon with partly sunny skies. What you don't see to the north is our next cold front perfectly timed to roll in and bring big change for your weekend -- assuming you don't work unlike this guy eh-hem. This cold front will be much like the others we've seen this season. Currently in Wyoming and Nebraska, the front will move through later Friday. Before it arrives, the clouds will increase this evening along with the wind speed. Upon arrival, the wind will switch to the north/northeast and the temperatures will begin to take a rapid tumble. The warmest part of Saturday happens first thing in the morning as the temperatures begin to fall throughout the day. It looks as though the "official" high temperature will be in the 30s, but what you'll feel Saturday afternoon will only be 20 to 25 with a much colder wind chill from the gusty northerly wind for most. It is important to note, that there is a certain degree of uncertainty especially Saturday how far south and west the coldest temperatures will setup. 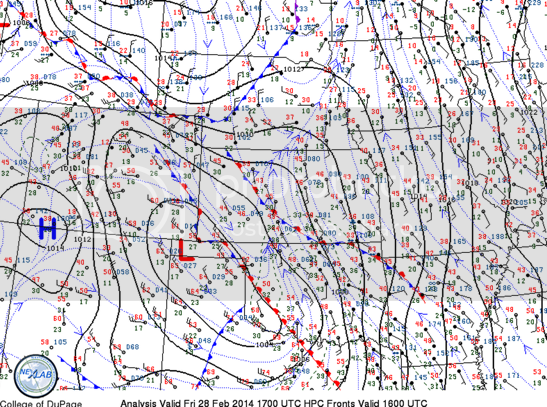 The temperature gradient across northeast Colorado will be quite dramatic. The front will be positioned over the metro area during the day Saturday, but will likely sway back and forth -- which could mean a few locations (especially south of the city) could actually jump into the 30s during the afternoon. In any case, let's plan for a chilly day, and if the front shifts enough to allow your location to warm up, consider yourself on of the lucky few! This cold will sink to the single digits and lower teens by Sunday morning, and then our thermometers will struggle to climb back into the 20s and very few low 30s by Sunday afternoon. The clouds this weekend will prevent any "warm thoughts," so a movie or DVR marathon may be your best bet. 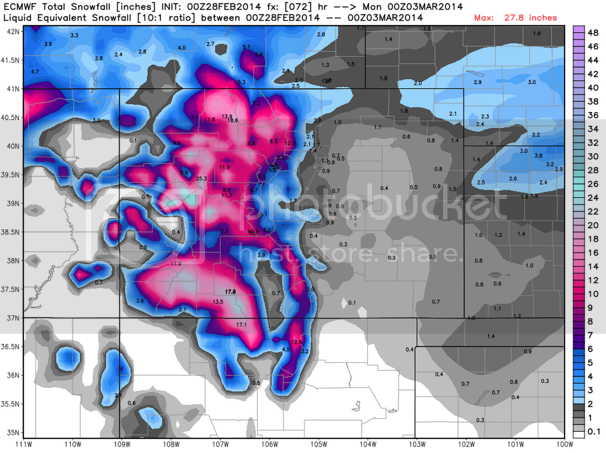 So far, Denver has yet to have a snowstorm this season with resulted in accumulation of more than 3". The vast majority of our storms have dropped far less than that, and this one looks the same. There is a chance for snow throughout this chilly snap -- mainly Saturday afternoon through Sunday morning. Amounts for the Front Range look small, another 0 to 2 inches or so. I usually describe these snows as sweep-able, not shovel-able. Also of note, although temperatures will be cold enough to support snow, the depth of the cold air may be too shallow, so some areas may have a bit of rain/freezing rain over the next 48 hours. The mountain snow, however, will need a good plow for the weekend. A steady supply of moisture there will drop upwards of two feet on the west facing mountain ranges from near Telluride to Aspen, and a bit less to those ranges north of I-70. Just like clockwork. As soon as you are back in your office chairs, your view Monday will be just like today with sunshine and and temperatures in the 50s. In fact, most of next week looks to be in the dry 50s until a possible storm moves through the region on Friday.